This post is written in partnership with Sprouts Farmer’s Market. All opinions are my own. Don’t miss out on the Sprouts massive frozen foods sale going on this month! Get 20% off all frozen favorites, all month long! 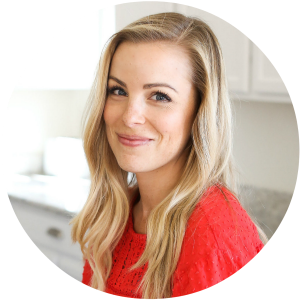 If you’ve been reading this blog for any length of time, you know I’m ALL about breakfast foods. I LOVE a good breakfast, whether that’s a meal prep recipe I pull out to enjoy a few days in a row, or a nice, slow weekend breakfast. 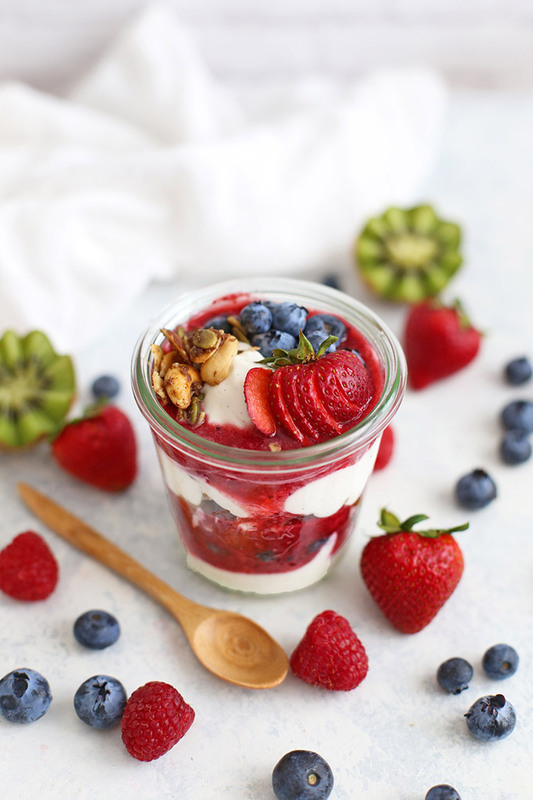 This paleo granola and fruit parfaits are good for both! 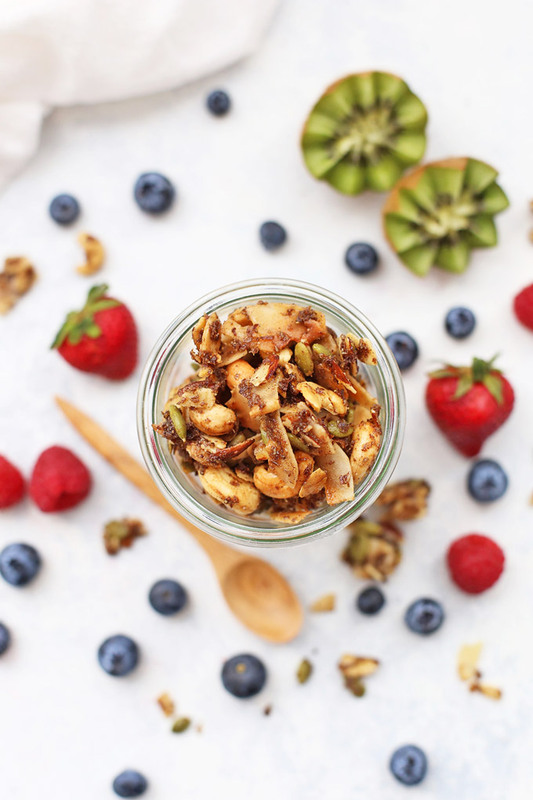 A gorgeous grain free granola, fruit puree, fresh fruit, and some dairy free yogurt all combine to make something beautiful and delicious you’ll come back to over and over again. As for the parfaits, there is SO much versatility and so many options. It’s ALL about the fruit puree. You start with your favorite frozen fruit, add a tiny bit of honey or syrup (if needed), a splash of juice, and some water, then give it a mix. The best part is, you can use whatever frozen fruit you like. I tried it with strawberries, blueberries, mangos, and a fantastic Cherry Berry Blend from Cascadian Farms. Every version was delicious! It’d also be fabulous with peaches, raspberries, or a combination of fruit! 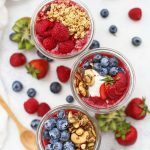 Frozen fruit has SO many yummy uses, so I always have several varieties in my freezer for smoothies, chia puddings, parfaits, desserts, and more. Now is the perfect time to stock up! To celebrate frozen foods month, Sprouts is running at 20% off frozen foods sale all month long. Pick a few options and have fun experimenting! Once you’ve got your fruit puree, you layer the it with dairy free yogurt. I love the So Delicious coconut yogurts, but you can also make your own pretty easily if you prefer. Next, add a little fresh fruit and a hefty sprinkle of your paleo granola to finish them off and they’re as beautiful as they are delicious. It doesn’t get better! 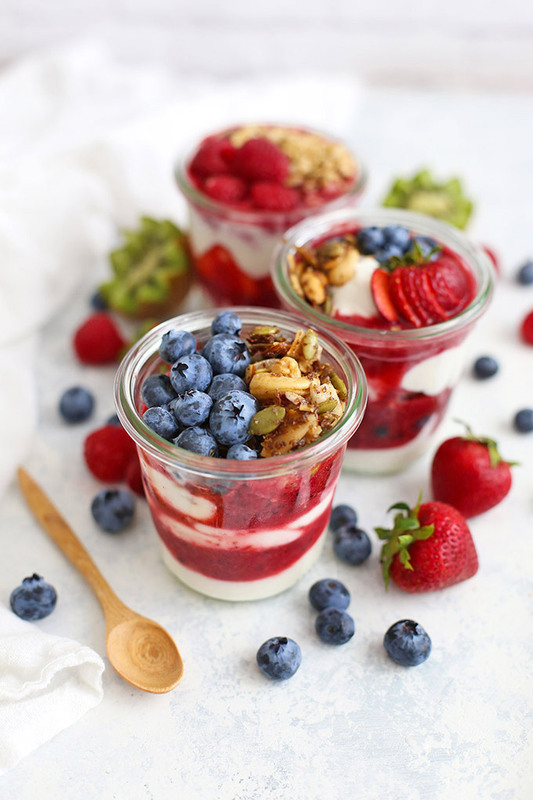 Storage & Make Ahead Tips – I make these in lidded jars so that they work well for meal prep, but they’re also really pretty if you’re setting them out for a build-your-own parfait bar. 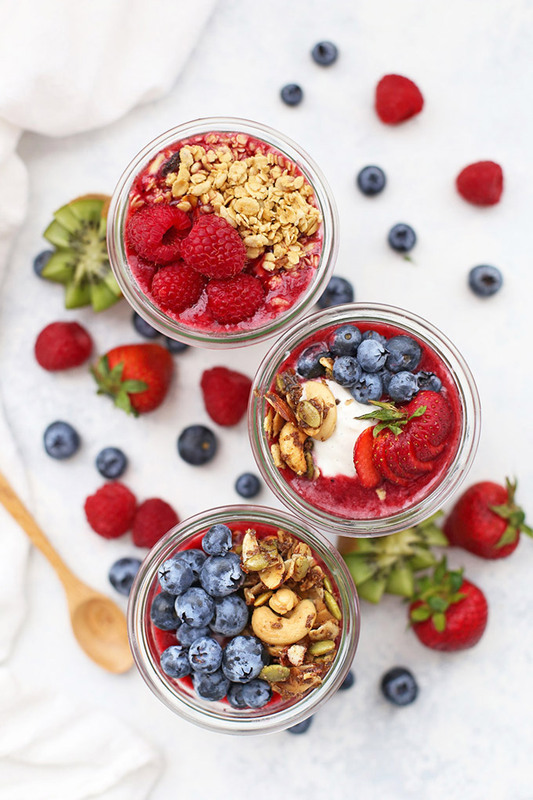 The fruit puree will stay good for 3-4 days, so you can layer your yogurt and fruit puree in several jars at once, then just add some fresh fruit and granola to serve! Frozen Fruit Puree – I’ve tried this with strawberry, blueberry, mango, and Cascadian Farms Cherry Berry Blend (pictured in these photos). Mix and match fruits to make your own combinations…strawberry-mango, strawberry-blueberry, raspberry-peach…the options are endless! 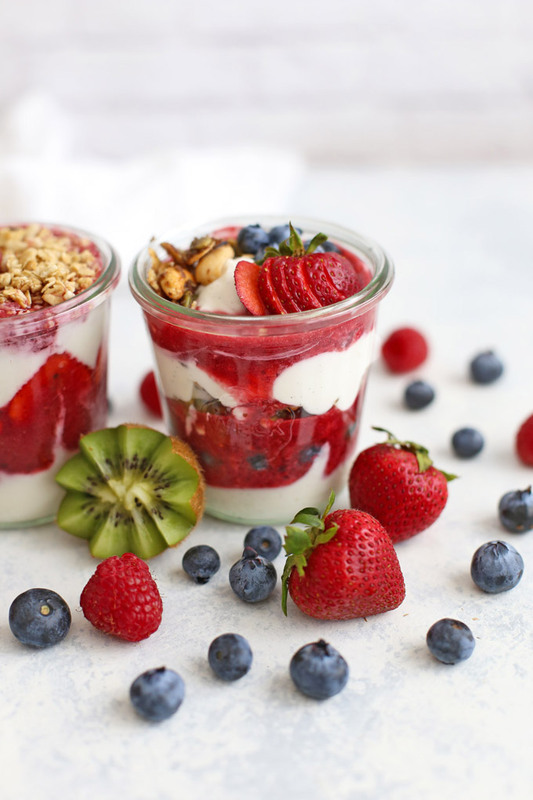 Make Them Pretty – These parfaits look extra gorgeous when you press cut fresh fruit against the side of the glass. Kiwi and strawberries work really well for this and keep well if you’re making them ahead of time. Coconut Yogurt – You can use any flavor of yogurt (dairy or non dairy) that you like for these, based on your dietary needs. My favorite non-dairy yogurt is So Delicious coconut milk yogurt, which I pick up at Sprouts. Sprouts has a TON of yogurt options (from grass fed organic yogurts, to coconut milk, almond milk, sheep’s milk, Greek yogurts, and everything in between). Improve Digestibility – Some people feel heavy or bloated after eating nuts/seeds. If that’s the case, it could be that you’re having trouble with some of the enzyme inhibitors or phytic acid. (Which all sounds fancy and complicated, but really isn’t). Soaking and dehydrating nuts and seeds is a great way to improve their digestibility, since soaking can help break down the enzyme inhibitors, introduce healthful enzymes, and reduce phytic acid. (You can read about the why and how here). It’s an extra step, but might be worth it if you plan on eating this often. If you eat nuts and seeds in moderation, you probably don’t need to worry about it. 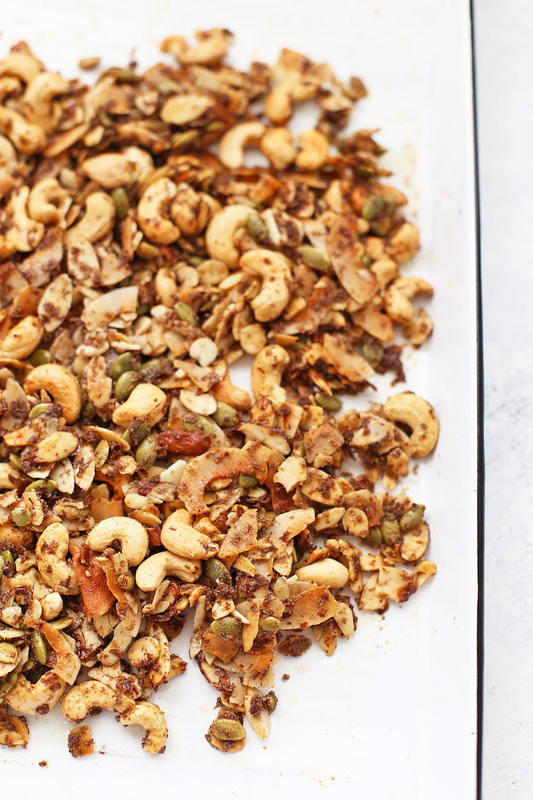 Choose Raw – Since we’re roasting the nuts and seeds in the oven, you’ll need raw nuts and seeds for this recipe rather than anything pre-roasted or salted. Sprouts has a GREAT selection of nuts and seeds available on their shelves or tucked into the bulk bins. I love stocking up when they’re on sale! Preheat the oven to 325 degrees F. Line a baking sheet with parchment or a nonstick silicone baking mat. In a large bowl, combine all granola ingredients, stirring well to combine. Spread out on prepared pan. Bake at 325 degrees for 25-30 minutes, stirring every 8-10 minutes for even browning. Remove from oven when golden and press mixture tightly together (this will create clusters as it cools). Place berries/fruit, juice, honey, and water in a blender or food processor and blend or puree until smooth. (If you’d like some texture, you can pulse it to break it up). If fruit isn’t blending well, allow it to soften and thaw for a few minutes before blending again. Don’t add additional liquid or it’ll be too thin. Oh hooray! That’s the best! Here’s hoping you love it as much as we do! Thank you! We’re having them again this morning. We can’t get enough! These look great? What is the calorie count for these? How many grams of protein?